There are 33 Assisted Living Facilities in the Orem area, with 7 in Orem and 26 nearby. The average cost of assisted living in Orem is $2,628 per month. This is lower than the national median of $3,346. Cheaper nearby regions include Pleasant Grove with an average starting cost of $1,800. To help you with your search, browse the 224 reviews below for assisted living facilities in Orem. On average, consumers rate assisted living in Orem 4.2 out of 5 stars. Better rated regions include Provo with an average rating of 4.5 out of 5 stars. Caring.com has helped 7 families in Orem find high-quality senior care. To speak with one of our Family Advisors about assisted living options and costs in Orem, call (855) 863-8283. The combination of family-friendly neighborhoods and proximity to towns like Provo and Salt Lake City helped propel Orem to number 14 on Time’s Best Places to Live list for 2017. Of the sprawling city’s 97,893 residents, just 8.9 percent are aged 65 years and older, but those seniors have access to more than 50 assisted living facilities, or ALFs. As per state regulations, ALFs in Orem are divided into two categories: type I, which includes more mobile residents, and type II, which offers extended services to residents with more advanced cognitive or physical disabilities. Both types are overseen by the Utah Department of Health. Seniors on a budget will discover that Orem’s cost of living is very close to the national average. While housing prices are relatively high, seniors can save money on utilities and health care costs. Safety abounds in Orem, where crime rates sit below the national average. The city’s violent crime is ranked 24.7 out of 100 versus 31.1 across the United States, and property crime is nearly a point under the national ranking. Orem’s annual average snowfall reaches a hefty 42 inches with January lows of 20 degrees, making it difficult for seniors with mobility issues to navigate the outdoors in winter. Summer is more comfortable, with highs of 91 degrees in July and below-average rainfall. Utah’s cities, including Orem, are serviced by a web of buses, trains and rapid transit routes run by the Utah Transit Authority (UTA). Seniors are eligible for reduced fares. The Orem area is home to world-class medical facilities, including Timpanogos Regional Hospital, Orem Community Hospital and Utah Valley Specialty Hospital, in the event of medical emergencies or illness. Orem has an array of community resources for seniors, including the Mountainland Area Agency on Aging, which provides seniors with both advocacy and essential services, as well as several senior centers. Assisted Living costs in Orem start around $2,628 per month on average, while the nationwide average cost of assisted living is $4,000 per month, according to the latest figures from Genworth’s Cost of Care Survey. It’s important to note that assisted living rates in Orem and the surrounding suburbs can vary widely based on factors such as location, the level of care needed, apartment size and the types of amenities offered at each community. 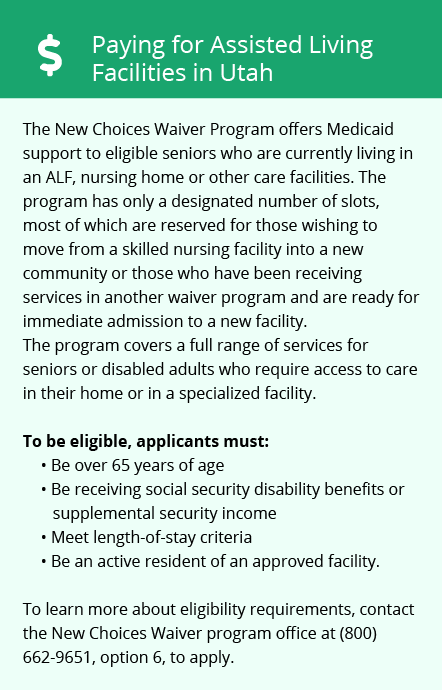 The Utah Home and Community Based Services (HCBS) Waiver, also called the Aging Waiver, is a Medicaid program that empowers Utah’s older residents to find the health and support services they need in the venue of their choice, whether that’s at home or in an assisted living facility. 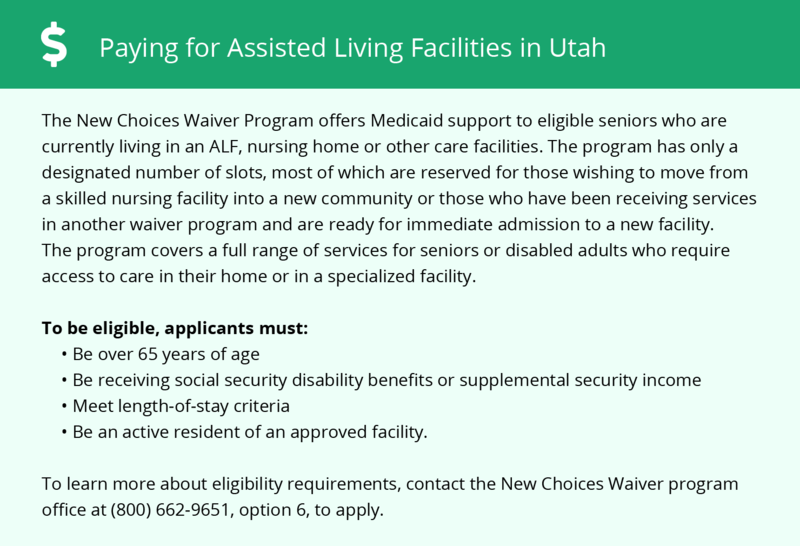 Utah also offers the New Choices Waiver, which is designed to help seniors transition from certain long-term care institutions into more community-oriented options. Orem and the surrounding area are home to numerous government agencies and non-profit organizations offering help for seniors searching for or currently residing in an assisted living community. These organizations can also provide assistance in a number of other eldercare services such as geriatric care management, elder law advice, estate planning, finding home care and health and wellness programs. To see a list of free assisted living resources in Orem, please visit our Assisted Living in Utah page. Orem-area assisted living communities must adhere to the comprehensive set of state laws and regulations that all assisted living communities in Utah are required to follow. Visit our Assisted Living in Utah page for more information about these laws.